In OMNIA Platform you can add your own entities, and each one is based on an OMNIA concept. All entities are modeled on a base concept, from the following: Agents, Commitments, Documents, Events, Generic entities, Resources or Series. How to add a new entity? The attributes allow you to define the structure of your entity. Each one will represent a property in the data you can read or write. How to add a new attribute? Collection: Another entity that will act as a ‘sub-entity’ of this one. Must be of a compatible type: Events or Commitments in a Document, and Generic Entities (only those marked as non-root) in any entity type. Is a list of records? : indicates whether or not this attribute will receive multiple values at once. 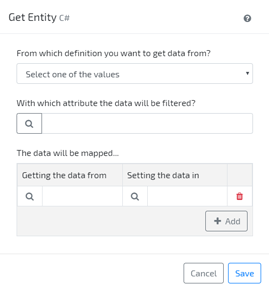 Uses data source from attribute: in Reference fields, indicates the field used to identify what data source instance to look for the Reference in (optional). How to set an attribute as required? In the attributes list, select the attribute you want to change and check the Is required? property. How to set an attribute as read only? In the attributes list, select the attribute you want to change and check the Is read only? property. How to remove an attribute? Picking the attribute you want to remove, select the option Delete and confirm your option in the confirmation window. In order to extend your application you can add new behaviours to your entities. Click here, to know more about behaviours. How to add a new behaviour? 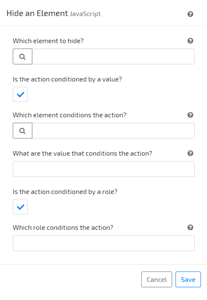 Get Entity This accelerator allows you to connect pre-existing attributes in a very simple manner, bridging the gap between them and allowing you assign an entity value to a different attribute, regardless of its context. Example: Get the UnitPrice of a Product (Resource) and output it to a purchase order document element. Execute Query This accelerator was built to enable you to execute queries and manipulate its output data in a different context that its initial. Example: Get all available products of a specific supplier, filter them by price range, and output that information directly on a document. Execute Application Behaviour With this accelerator, you’ll be able to easily execute Application Behaviours and its output data, regardless of context. Example: You have an Application Behaviour that calculates currency rates, based on online values. Call and execute that behaviour from any entity. How to edit the execution code of a behaviour? In the behaviours list, select the behaviour you want to change and, in the code editor, write the new code you want to execute. How to remove a behaviour? Picking the behaviour you want to remove, select the option Delete and confirm your option in the confirmation window. In OMNIA Platform you can customize how the fields are shown in the form to create or edit of your entity. Automatically, the platform adds and removes user interface elements when a new attribute is added or an existing one is deleted from an entity. The form layout is organized with Rows and Columns. Each row is divided horizontally in 12 columns. How to add a new element? How to add a new container element? How to add a new calendar element? How to change the positioning of an element? In the User Interface tab, select the element you want to change and, in the Row and/or Column fields, set the new positioning values. How to change the size of an element? In the User Interface tab, select the element you want to change and, in the Size field, select the new size. How to remove an element? Picking the element you want to remove, select the option Delete and confirm your option in the confirmation window. In order to extend your application user interface you can add new behaviours to your entities’ user interface. Click here, to know more about user interface behaviours. Hide an Element The accelerator will allow you to easily select an interface element you wish to hide and add the conditions (value or role) that will trigger that behaviour Example: A user selects his payment option and that action will hide the unnecessary elements. Set Element Read Only Easily select an interface element you wish to define as Read Only and add the conditions (value or role) that will trigger that behaviour Example: Depending on the user role, allow your Supplier to edit the field “Unit Price”, while the custumer only sees it as read only. Add Validation Message Quickly add validation messages to your interface elements, add the trigger conditions (value or role) and define the content of your message Example: If a user tries to add an invalid email on a field, an error message is returned indicating that. How to hide an element? How make an element read-only? How to set an element value? How to add or remove a message? How to manage the state of the add and remove options in an editable list? How to move an element to the details area of a grid? How to redirect to another application page? How to have asynchronous behaviours? How to change the shared attribute’s lookup list? How to filter a shared attribute’s lookup list? How to execute an action when the view is changed? How to set the categories of a calendar? To each category is possible to define the name (used as the unique identifier), a title and a color. Is also possible to set the category as inactive by default. How to execute an action when a category is toggled?